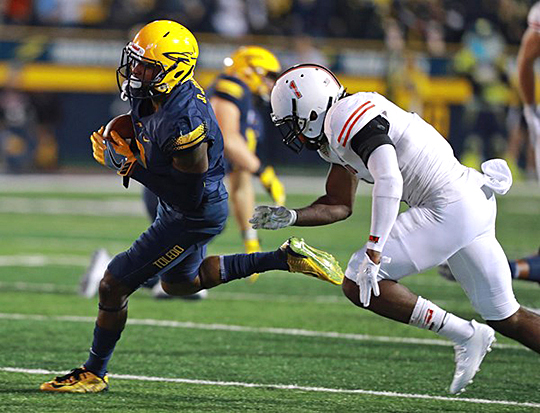 It’s November, and in the world of college football, that means MACtion, and with MACtion comes the annual showdown between Toledo and Northern Illinois. The Rockets and Huskies will meet in DeKalb Wednesday, Nov. 7, in a game that has serious consequences in determining the West Division representative to the MAC Championship Game Nov. 30. In fact, in every single season since 2010, Toledo and NIU have met in November with the Mid-American Conference West title still at stake for one or both schools. And like most of those games, this one is critical for both the Rockets and Huskies. Toledo (5-4, 3-2 MAC) is two games behind and cannot afford another loss. For all intents and purposes, the Rockets need to win the rest of their games and have NIU (6-3, 5-0 MAC) lose at least one more time. NIU has some breathing room, but could officially knock Toledo out of the race with a win. for 166 yards in the Glass Bowl last year. The Rockets are coming off a 45-13 win over Ball State Oct. 31. Sophomore Eli Peters led the Rocket offense to 531 yards of total offense, but it was the Toledo defense that shined most. The Rockets forced five turnovers, including a forced fumble that was recovered for a touchdown, in leading UT to victory over its West Division foe. Toledo also had four sacks and limited the Cardinals to just 94 yards rushing in 35 attempts. Peters, stepping in for the injured Mitchell Guadagni, completed 25 of 34 passes for 327 yards and two touchdowns in guiding the Rockets to victory for the second time this season. Northern Illinois is coming off a 36-26 victory at Akron Nov. 1. The Huskies feature the league’s No. 1 scoring defense (21.7) and rushing defense (103.8). Junior defensive end Sutton Smith leads the MAC with 14.0 tackles for loss. On offense, NIU is run-oriented, with sophomore Tre Harbison leading the way with 665 yards and four touchdowns. Kickoff is set for 8 p.m. Eastern; the game will be televised on ESPN2. Toledo leads the series with Northern Illinois, 31-14. The Rockets have won two in a row in the series, 27-17 at the Glass Bowl last year and 31-24 at Guarantee Rate Field in Chicago in 2016. Toledo’s last win in DeKalb came in 2006, a 17-13 triumph. Toledo leads the MAC in scoring (41.2), second in rushing offense (204.3) and third in total offense (440.1). Toledo’s defense has had 14 sacks in the last three games. Senior placekicker Jameson Vest broke two career records vs. Ball State Oct. 31. He connected on the 69th field goal of his career, breaking the previous record held by Rusty Hanna (1989-92), and he successfully converted his 212th career extra point, topping Jason Robbins (2002-05) for most in school history. This entry was posted on Tuesday, November 6th, 2018 at 3:01 am and is filed under Athletics, Events, News .